The story begins with Josephus, the first century Romano-Jewish scholar and historian, who explains in his writings that Herod the Great expanded the “Baris” (the Greek word for “tower”), built by John Hyrcanus, the famous second century B.C.E. Jewish leader, to replace the citadel which had formerly protected the temple in the City of David (pre-Babylonian Jerusalem). Josephus effuses about its splendor and how much Herod, a prolific spender, dispensed for its construction. 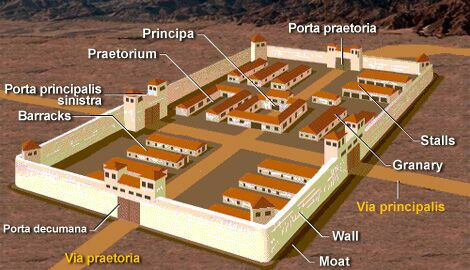 Herod dubbed the Roman camp “Fort Antonia” after his friend, Mark Antony, and it assured his reputation as a master builder by its unparalleled magnificence. It must have been about 40 acres in size, like other typical Roman camps capable of housing a legion of 5,000-6,000 soldiers. 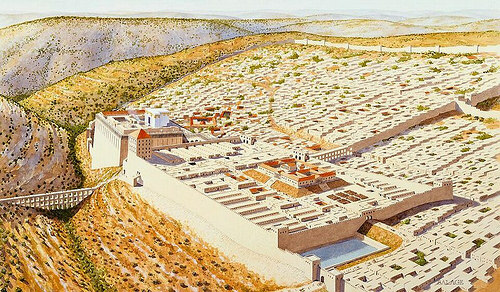 Josephus described it as being “erected upon a rock of fifty cubits in height” on a “great precipice.” It had “all kinds of rooms and other conveniences, such as courts, and places for bathing, and broad spaces for camps, such that it had all the conveniences of cities and seemed like it was composed of several cities.” With 60-foot walls, four towers (the southeast being 105 feet high), and smooth stones installed on its slopes, it dominated the temple to its south, ready to fend off the most formidable attacks. When any trouble brewed in the temple, or to keep peace during the festivals, Roman soldiers poured out of Fort Antonia onto two 600-foot aerial bridges, connecting it to the roofs of the temple porticoes, whereupon they dispersed around its four-furlong perimeter. If need be, the soldiers could rain their arrows down upon the people in the outer courts or descend via staircases to perform hand-to-hand combat. In most respects, the traditionalist model does not match up with Josephus’s descriptions. For example, it is not laid out as a camp, but does look like a castle. Josephus’s account encompassed both descriptions. It does not have the size of “several cities,” nor does it look like a city. It does not exhibit the “magnificence” a huge expenditure would suggest. It does not feature slopes which would accommodate slippery tiles. It does not “dominate” the temple. It is not separated from the temple by a distance of 600 feet, and there are no aerial roadways connecting it to the temple. However, the traditionalist model does show four towers, one higher at the southeast corner. Archaeologically, the northwest and northeast corners do show signs of towers. However, Herod’s temple foundations did not have any towers. But most significantly, the major problem with the current traditionalist models is how they do not resemble a typical Roman camp in size, shape, or function, while the 36-acre walled edifice does. After the Romans destroyed Jerusalem during the First Jewish-Roman War in 70 C.E., they turned their sights on Masada, Herod’s magnificent fortified palatial complex high atop a plateau in the Judaean Desert overlooking the Dead Sea. Josephus quotes Eleazar, the Jewish leader of Masada, as trying to convince his people to commit suicide rather than being taken captive by the Romans upon the Jewish defenders’ impending defeat. Eleazar asks them: “Where is this city that was believed to have God himself inhabiting therein? It is now demolished to the very foundations, and has nothing but that monument of it preserved, I mean the camp of those that have destroyed it, which still dwells upon its ruins…And I cannot but wish that we had all died before we had seen that holy city demolished by the hands of our enemies, or the foundations of our holy temple dug up after so profane a manner” (War VII, 9, 376, 379, Whiston translation). The traditionalists have ignored the first part of this passage regarding the surviving Roman camp and simultaneously interpreted the destruction of the temple to mean only the sanctuary and the inner precincts, with support from the use of “naos” (sanctuary) in the original Greek. Adherents of the Fort Antonia identification of the “Temple Mount” bank on Whiston’s “foundations” being dug up as referring to those of the whole temple mount, because when Christ directed his disciples to gaze at “these buildings” after their question concerning the temple’s demise, the most visually prominent building would have been the 450-foot high temple mount. Hence, a literal interpretation of Christ’s prophecy that not one stone would be standing upon another would dramatically illustrate the utter end of the temples and Jewish worship therein, as opposed to the traditional view that more than 10,000 stones victoriously stood in place—the stones of the traditional version of the “Temple Mount.” However, archaeology in the City of David has thus far reinforced the total destruction interpretation of Christ’s prophecy, as no two temple stones standing upon one another have been found. Nevertheless, in 1968, in the southwest area of the “Temple Mount’s” southern wall, archaeologist Benjamin Mazar discovered a stone incised with the square Hebrew alphabet used in the Herodian period. 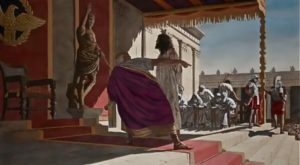 The decipherable words were interpreted to mean “To the place of trumpeting,” an actual location on the temple mount walls mentioned by Josephus where the priests blew a trumpet to announce the beginning and end of the Sabbath day. Mazar assumed it had fallen from the southwest corner. In addition, in 1871, Clermont-Ganneau found a warning stone at the northwest corner of the graveyard abutting the traditional temple mount wall (see Numbers 1:15). These stones were placed at intervals in the Soreg, and in 1936, J. H. Illiffe found a partial fragment in another stone in the Lion Gate. Hence, the tradition claims these three stones affirm the “Temple Mount’s” identity, though none were found “in situ” and Aquila (c. 128-177 C.E.) famously described the temple ruins as “like a quarry, all the inhabitants of the city choosing stores from its ruins as they will for private as well as public buildings.” Meanwhile, the same yardstick has not been equally applied to relate the proximity of Roman military buildings “in situ” and myriad Roman artifacts nearby, as a sign that the 36-acred walled edifice is Fort Antonia. The traditionalists can point to the following statement by Josephus about the siege of Titus: “For the Jews, by demolishing the tower of Antonia, had made their temple foursquare, while at the same time they had it written in their sacred oracles, “That then should their city be taken, as well as their holy house, when once their temple should become foursquare” (War VI, 5, 311). Taken out of context, this statement clearly explains that the Jews had demolished Fort Antonia, as traditionalists believe. Taken in context, it is clear the demolition of Fort Antonia actually meant only the destruction of the two 600-foot aerial bridges, which connected it to the temple. Josephus’s account of the siege shows the Jews never had the time, means, or opportunity to destroy a castle-like Roman camp of several cities size defended by masses of Roman soldiers in front of and behind 60-foot walls. A part of the Jews desperately defended the temple. The rest were confined and guarded in walled sections of Jerusalem. The demolition of Fort Antonia described by Josephus must be associated with his accounts of the temple mount’s measurement, stated in several places to be a four-furlong or four hundred cubit square. However, in one place, he includes the two 600-foot aerial bridges and the plaza beneath in the measurement of the temple and says it was a six-furlong rectangle. 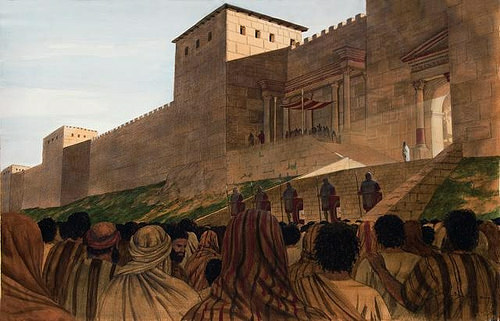 When both the Jews and Romans destroyed the bridges, the square temple stood alone, fulfilling the prophecy: “When square the walls, the temple falls.” This literally happened when the battles taking place atop the bridges ended at their destruction, while soldiers constructing siege banks against the temple’s north wall hastened their completion. When the break-through came, the battles began in the temple outer courts and lasted until Roman soldiers seized the sanctuary. How did the two 600-foot aerial bridges disappear from the pages of history? They were still there in two 19th century books written by scholars Thomas Lewin, and William Sanday and Paul Waterhouse. These men probably read Josephus in the original Greek, while others succeeding them relied on the eminent 18th century translator, William Whiston. Whiston probably decided, taking the “Temple Mount” tradition as his guide, that Josephus had erred in War VI, 2, 144 when he described the exact length of the aerial roadways as a furlong, replacing it with “no long space of ground.” He must have felt obliged to do this, based on Jerusalem topography and the impossibility of placing Fort Antonia six hundred feet north of the alleged “Temple Mount.” Although there are ten references in Josephus to these bridges, Whiston’s translation obscured their existence and without Dr. Ernest L. Martin’s seminal book, The Temples that Jerusalem Forgot, they would still be forgotten today. Martin’s model shows the two bridges and the separation between the temple mount and Fort Antonia. 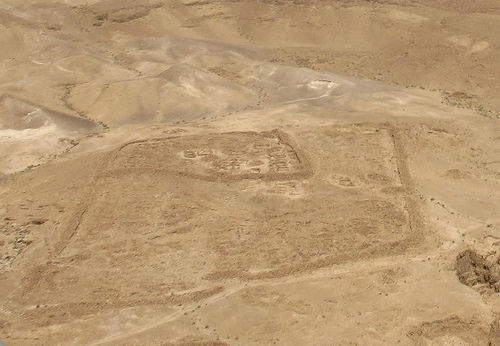 But Balage Balogh more dramatically illustrates the statement by Josephus that Fort Antonia blocked the view of the temple from the north, implying the two structures were on different elevations. A careful reading of Acts 21:30-40 in the New Testament provides confirmation for this detail. In this passage, an angry mob seizes the Apostle Paul and throws him out of the Temple. In response to this uproar, the soldiers and centurions “ran down” to retrieve Paul from the mob and bound him. When Paul preached to this mob, he was “on the stairs” and the soldiers had to “go down” again to retrieve him from the Pharisees (Acts 23:10). This scenario can easily be reconstructed when the stairs south of the traditional temple mount uncovered by Benjamin Mazar (and also illustrated in Martin’s model) are identified as those belonging to the castle mentioned in Acts. In the traditional models, Fort Antonia stands on a scarp slightly elevated above the “Temple Mount,” but do not have the requisite plaza and stairs on the south side, as the models are flush against the “Temple Mount’s” north wall. Based on Fort Antonia’s new identity as the “Temple Mount,” traditionalists carefully noted Josephus’s statements that Fort Antonia “was situated at the corner of two passages of the court of the temple; on that of the west, and that of the north” and that it “joined to the north part of the temple.” They also knew from Josephus that during the siege of Titus, the soldiers attacked Fort Antonia through the Struthion Pool. Hence, scholars deemed a pool to the north of the “Temple Mount,” under the Convent of the Sisters of Zion, as the Struthion and the Convent emerged as the conjectured location of the former but now allegedly defunct Fort Antonia. However, according to The New Encyclopedia of Archaeological Excavations in the Holy Land (1993), scholars eventually dated the remains adjacent to and under the Convent to Hadrian and even later. This location then fell into disrepute, though traditionalists still claim the Struthion Pool is the one described by Josephus. The new conjectured location for Fort Antonia then moved closer to the “Temple Mount” on a rock scarp directly north of it, a space now occupied by the Omariya Boys School. This scarp measures only 394 by 147 feet, so the former Roman camp had to shrink from about 40 acres to about 1 1/3 acres in order to fit. Nevertheless, the Duc de Vogii, Dr. Edward Robinson, Claude Conder, Sir Charles Warren, and Sir Charles Wilson supported the site. Even though F. E. Peters and others felt this scarp would be too small to contain the edifice described by Josephus and proposed that part of the Fort must have been imposed on the northern area of the “Temple Mount,” the rock scarp location has prevailed and is the reason Fort Antonia is now pictured as a relatively small castle at the northwest corner of the “Temple Mount.” However, the traditionalists give only the fact of the scarp’s existence as proof of its identity. There hasn’t been a single sherd, etching, coin, or packet of dust to prove that a Roman camp of several cities’ size once stood there. Without recognizing there were two 600-foot aerial bridges, scholars degraded the once-magnificent Roman camp to a Grade B location, failing to recognize how the bridges joined the temple to Fort Antonia on the north. Although four legions had fought at the siege of Titus, only the Tenth Legion would remain behind, stationed at Fort Antonia. 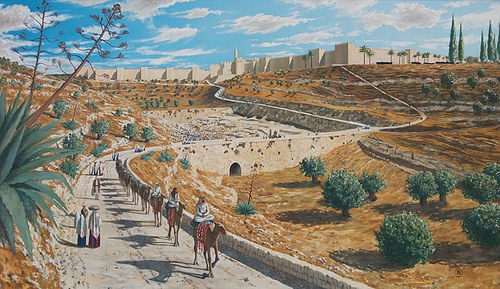 A victory celebration had been conducted there, but the decimation of Jerusalem was not complete and Josephus describes Titus gazing out at the western hill from the vantage point of the camp. He sees Herod’s three marvelous towers—Hippicus, Mariamne, and Phaesalus—and parts of the western wall near them. He feels they should remain standing to show what kind of a city Jerusalem had been and they could be used to afford a camp for “such as were to lie in garrison.” These statements lend credence to the traditionalist views that Fort Antonia had been destroyed, the whole Tenth Legion lay garrisoned in the towers and on the western hill, and the “Temple Mount” stood abandoned. However, it is evident that Titus changed his mind or someone overturned his command, as there are no further descriptions of the three towers or the western wall by persons who witnessed Jerusalem’s destruction and even Josephus said the “local towers” were destroyed. Other than Eleazar, no eyewitnesses to Jerusalem’s destruction ever mention the gargantuan “Temple Mount” or Herod’s towers. They always refer to the total devastation of Jerusalem and the temple, giving rise to the supposition that they did not consider the 36-acre walled edifice as part of Jerusalem, nor did they consider it to be the temple. Likewise, accounts of the Byzantine-era pilgrims reveal they identified this remaining monument as the Praetorium, the Roman camp, and described the temple ruins with features consistent with the southeastern hill—Mount Zion, the fountain of Siloam, Eudocia’s east city wall, and the two pools of Siloam. Instead, Roman military structures and artifacts are mostly found near and under the “Temple Mount.” Excavations by Benjamin and Eilat Mazar at the southwest corner have revealed a Roman bakery and further north, a Roman bath house. Since these structures were unearthed above the 70 C.E. destruction layer, Eilat Mazar conjectured that the rising number of legions in Jerusalem during the Bar Kochba rebellion (estimated to be 9-13) caused the Tenth Legion to go up on the formerly abandoned “Temple Mount.” Hadrian put down the rebellion, but at an enormous cost to his armies. He then built the city of Aelia Capitolina, with the goal of eradicating all things Jewish from the former Jerusalem. Hence, one might reasonably ask why Hadrian would retain the “Temple Mount” as its dominating monument. Due to the prevailing temple mount tradition, Zweig failed to recognize there are “records of such constructions.” They are found in accounts from Byzantine-era pilgrims who identified the edifice as the Praetorium or the Hall of Pilate, not the “Temple Mount”. There are several pre-tradition accounts of two churches in the Praetorium. Theodosius (530 C.E.) mentions Eudocia’s Church of Saint Sophia in the Praetorium. Then Antoninus Martyr (a.k.a. the Piacenza Pilgrim), at about the same time, combines the Basilicas of the Blessed Mary and Saint Sophia and calls them the Praetorium. Antoninus also refers to a square stone in the “midst” of the Praetorium, where the Lord was tried. The Breviarius lists the Church of Holy Wisdom as a church at the House of Pilate. Arculf (680 C.E.) claims Omar built his house of prayer over ruined remains. The Venerable Bede echoes this tradition. Arnold Von Harff, as late as 1496 C.E., identifies the remains as those of the Church of Our Blessed Lady. In Burchard of Sion’s time (1283 C.E.) the 36-acre edifice was called the Tower of David, but Burchard said some identified it as Antony’s Tower. In addition, Eutychius (876-940 C.E.) writes that when Caliph Abd al-Malik rose to leadership, he sought to demonstrate the ascendancy of Islam over Christianity in Jerusalem and ordered the construction of the Dome of the Rock to compete with the Church of the Holy Sepulchre on the opposite hill. Eutychius vouchsafes the location of the Church of Saint Sophia over the Sakrah when he claims that al-Malik built the Dome of the Rock on the site of a Christian Church that he destroyed. Eutychius also states that the Christians did not build a church over the temple ruins, because of Christ’s statement that there would not be one stone left standing upon another. Hence, Eutychius never considered the Dome of the Rock as the site of the temple, because that site had formerly been occupied by a Christian church. A major factor in the establishment of the temple mount tradition was the absence of the Jews from Jerusalem for long periods. They had been ousted by Titus, then Hadrian, and then by Christians during the Byzantine era, but when 70 families asked Omar for permission to return, they asked to be in the “southern” part of the city, near the waters of Shiloah, and the temple and its gates. When the Muslims took over the “Temple Mount,” the Church of Our Blessed Mary lay in ruins and the Church of St. Sophia stood over the Sakrah. Muslim tradition alleges that Omar transferred the temple’s foundation stone from the temple ruins to the southern end of the 36-acre walled edifice. This was the first arrival of a temple-related artifact and “the toe-in-the-door” of the “Temple Mount” tradition. Over time, the “foundation stone” changed locations to the Sakrah and eventually transmuted into the Sakrah itself, which then became the foundation stone of Solomon’s temple. 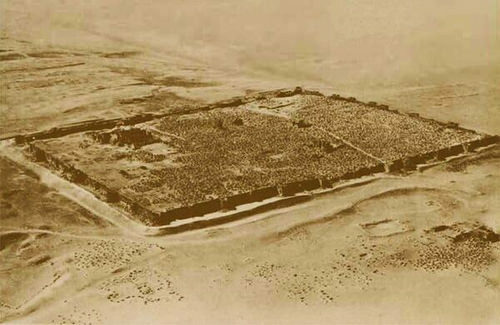 The Muslims instituted the temple mount tradition, promoting the Sakrah as the site where David prayed, where Solomon built the temple, and where Mohammad departed on his Night Journey. When the Crusaders arrived, they were entirely ignorant of any authentic identifications and promptly dubbed the Dome of the Rock the Templum Domini and the Al-Aqsa Mosque the Templum Salomonis. Apparently, the few remaining, downtrodden Jews in the city failed to keep the truth alive. In addition, the temple ruins were no longer recognizable and the Jews’ last site of worship, instead of being at the site of the ruins, had been in a synagogue on the Mount of Olives. The Jews gradually embraced the Crusader identifications and commenced worshipping at the east wall, then, in the 16th century, at the Western Wall. All these factors contribute to F. E. Peters’ complaint that when studying Jerusalem, he noticed various sites would “flutter disconcertingly” from one side of the city to the other. Since the “Temple Mount” is today under the authority of Muslim overseers, non-Muslims are not allowed beneath it, a frustrating situation for many archaeologists who can only dream to investigate the site for new evidence. 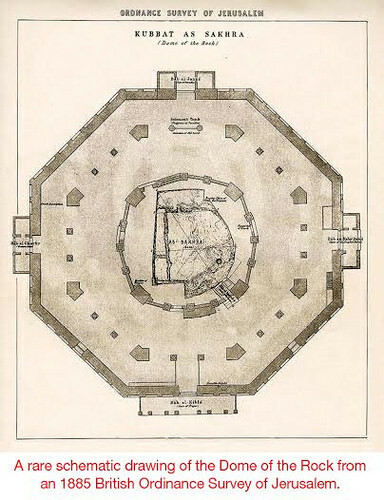 Nevertheless, Charles Wilson mapped the underground cisterns and aqueducts in the 19th century, and various persons have entered into the southern extension, taken pictures of ‘Solomon’s Stables’, described the gate underneath the Golden Gate, viewed trenches exposing walls near the Dome of the Rock, and walked through the tunnels extending from the gates. Excavations to the south and along the western and eastern walls, as well as the sifting project, have yielded column and capital fragments; fragments of Roman marble statues, inscribed stones, one with the discernible word “elders” and one in Latin honoring Vespasian, Titus, and Silva; the base of a statue dedicated to Hadrian (embedded into the lintel of the Double Gate); pottery and stone vessels; bullae (Roman amulets); stone seals, several thousand coins, and more. Collectively and individually, the finds give information about the occupation of both the “Temple Mount” and the southeastern hill. Unfortunately, certain of the finds can be interpreted as “proof” for both proposed identities of the temple mount and Fort Antonia, because of the proximity of the two edifices and numerous siftings and destructions by time, war, earthquake, and new constructions by changing regimes. A more effective method to distinguish the two is to apply ancient descriptions of the temple mount to the traditional edifice’s placement, dimensions, gates, walls, size of stones, and water system. 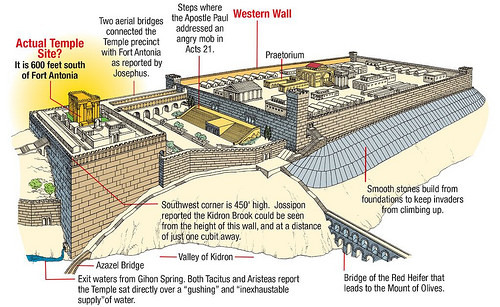 For example, when Aristeas claims there was a natural spring under the temple, this can be compared with the lack of a known spring under the traditionalist “Temple Mount.” When Maimonides says the Ark of the Covenant was hidden in the deep and winding tunnels under the temple, this can be compared with the straight tunnels under the traditionalist “Temple Mount.” When Josephus says the temple was completed, this can be compared with the unfinished northwestern corner. When Eusebius says the temple site became a garbage dump, this can be compared with the lack of such findings under the “Temple Mount,” while many garbage sites have been uncovered on the southeastern hill. When Josephus describes the foundations as starting in the Kidron Valley and ending as a four-furlong square 450 feet high, this can be compared with the 922 by 1596 by 1040 by 1556-foot measurements of the “Temple Mount” trapezoid, whose maximum height is 158 feet, upslope from the Kidron Valley. 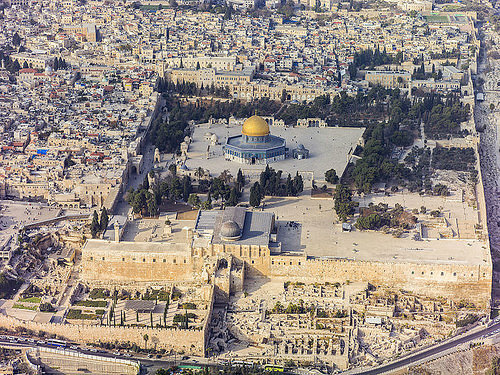 The traditionalists have attempted to remedy the size issue by drawing a 500 cubit square (the dimensions given by the Mishnah) around the Dome of the Rock. More recently, Leen Ritmeyer has taken the trouble to find many signs on the “Temple Mount” which show that Solomon’s temple was actually an 861-foot square. This, however, does not coincide with the eyewitness account of Hecateus of Abdera who described the temple of Solomon as being “in the middle of the city” (on the southeastern hill) and measuring 500 feet by 150 feet. Ongoing excavations on the southeastern hill are lending more support for the Fort Antonia identification of the “Temple Mount” and the City of David location for the temple. The recently uncovered cyclopean stone towers, meant to protect the Gihon Spring in the Middle Bronze Age II, served the same function as Solomon’s temple, built 1,000 years later in the same location. Small tunnels leading from the hill’s center to the sewer under the street of the Tyropoean Valley have been identified as possible water and blood disposal channels from the slaughtering tables on top of the ridge. A golden bell, similar to those described on the High Priest’s robe (Exodus 18:34), has been found near the proposed vicinity of the temple. Excavations in the Warren’s Shaft area of the Gihon Spring have exposed new tunnels under the central hillside, which lead to what was previously an unknown water source—the manmade Rock-cut Pool. Mysterious rooms nearby on the hillside have provoked curiosity and new conjectures, including the existence of an altar there. But most importantly, one of the major archaeologists working in the City of David, Eli Shukron, has made it known (but not publicly) that he believes the temples once stood there. Only time will tell if the existing and growing evidence will be sufficient to overturn the prevailing tradition hiding Fort Antonia’s true identity, but non-traditionalists are hopeful. 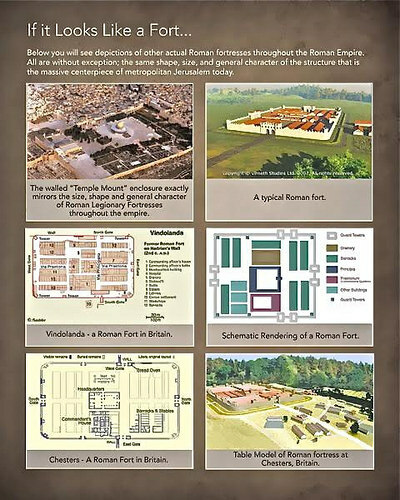 Few modern scholars had a better hands-on knowledge of Temple Mount topography than Dr. Ernest Martin, who first published his unorthodox and controversial findings on the location of the Solomonic and Herodian temples in 1998. Over a 5-year period, Dr. Martin worked with noted archaeologist Dr. Benjamin Mazar and Hebrew University in extensive excavations on Mt. 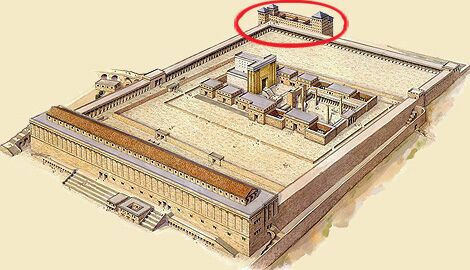 Zion* and came to the conclusion that the “Temple Mount” structure is in fact the remains of Fortress Antonia, “hiding in plain sight”. His research on other topics has been included in such standard works as the Handbook of Biblical Chronology, and his books and research have garnered favorable reviews from such noted scholars as F.F. Bruce and W.H.C. Frend. Does this interest you? You can read more about this at jerusalemtemplemountmyth.com.